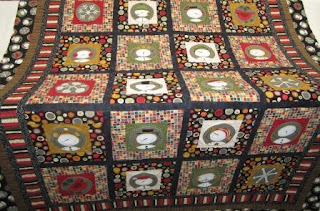 I have been very busy long arm quilting for my customers this past while. This is one of the more Christmas like quilts I have done. 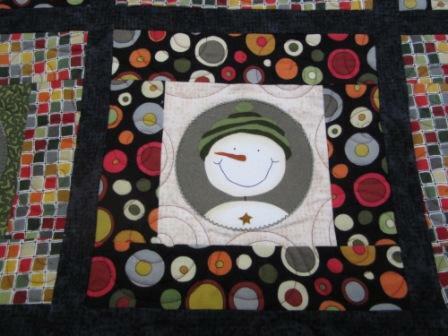 Maureen made this flannel snowmen quilt and asked me to quilt it for her. It is a Christmas present. We used many spirals all over the quilt except were the faces were. I love to do spirals all over by free hand. This is most of the quilt. I have been taking the overall photos with the quilt draped over the frame of the machine. It is not always the best photo but it gives you an idea for the whole quilt. If I really need a good all over photo I have to go to my mom's house. She has a large design wall in the basement were we take our photos for quilt shows and have better lights too. I hope you all enjoy Tuesday Quilt Bee. Thank You also for all the great comments this past while. The comments keep me going. I love to share my work with you but if I do not get comments I start to wonder why am I doing this. So the comments keep me going. Thank You. Also welcome new followers. I have had a few new followers added this past month. Love the snowmen! Those swirls really compliment the quilt.